As a student of servant leadership, I’d had the pleasure of reading a number of books on the subject, several while taking the Key Practices of Servant Leadership course through the Robert K. Greenleaf Center for Servant Leadership in Atlanta, Georgia. 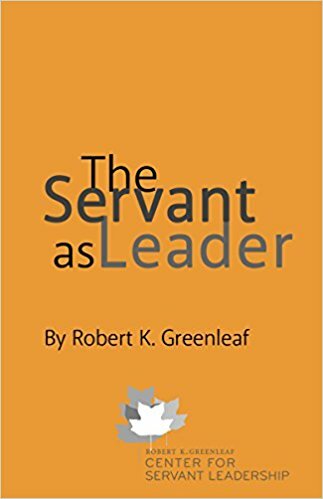 The Servant as Leader by Robert K. Greenleaf – Published in 1970, Greenleaf’s original work on the subject is still the go-to classic. Seven Pillars of Servant Leadership by James W. Sipe & Don M. Frick – This book takes a deep dive into seven facets of servant leadership, providing thought provoking examples as well as concrete ideas. Start With Humility by Merwyn A. Hayes and Michael D. Comer – The inherent strength in humility is often overlooked. This book will help you see and understand it. The Journey to the East by Herman Hesse – This book was the inspiration for Greenleaf’s original work.